A special occasion deserves a special gift, something unique that has been chosen specifically for that person. 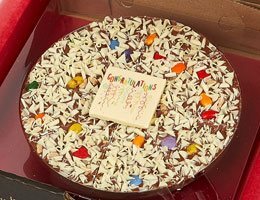 Whether it’s to say thank you, congratulations, well done or happy birthday, a little something to send a person well wishes is a lovely thought that will be greatly appreciated. 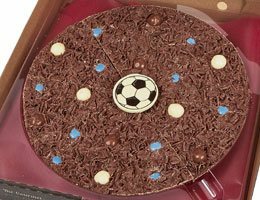 We have created a unique range of handmade chocolate gifts to do just that, to help your loved one celebrate their occasion and remind them that you care about them and are proud to be in their life during this important time. 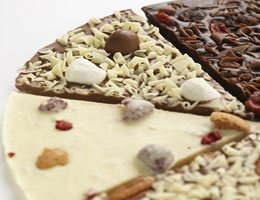 Our Belgian chocolate pizzas are made from the finest gourmet chocolate and topped with a unique selection of complimentary toppings. 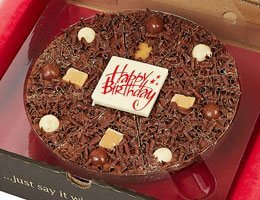 You can choose the flavours based on the recipient’s personal tastes and add a custom message with a gift card or by adding a personalised chocolate plaque based on the occasion. 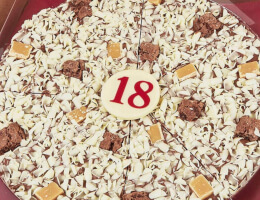 For example, our congratulations and happy birthday pizzas have a chocolate plaque in the middle of the pizza with a custom message printed on top. 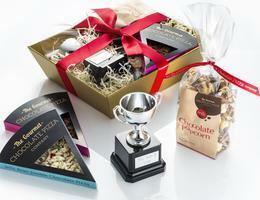 Our ‘well done’ hampers include a trophy saying ‘you are a star’ as well as various chocolate treats. 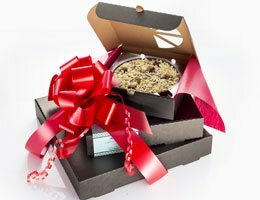 We also have various other ways of customising our gifts to suit your loved ones, including custom packaging and flavours. Our gifts are suitable for all occasions, and chocolate is a timeless present that will always be appreciated. However, for those of you looking for something more specific, please visit the individual pages of our seasonal items.